I couldn’t resist requesting this book when I spotted it on Net Galley recently because I’ve previously read Kathi Lipp’s book Clutter Free and her ideas really have helped me have a much more organised (and streamlined!) home. This is a guide to getting organised for Christmas and it’s really useful. In short, easy to follow chapters Kathi explains how to be much more organised in the run up to Christmas. Each chapter is dedicated to a different element of Christmas planning and everything is broken down into easy to manage tasks. The idea being that the planning is started early so that there is no last minute rushing to cause stress as Christmas gets closer. Get Yourself Organised for Christmas contains chapters on a variety of Christmas tasks. It may be that not all the tasks are relevant to how you spend the holidays but the book is set out in such a way that you can mark the chapters that will be helpful to you and then focus on those. My favourite chapter, and one I will frequently refer back to, was about making a Christmas binder that I can then amend each year but will basically contain all of my lists, recipes, gift ideas etc all in one place. It’s such a simple idea yet one I’d never come up with myself. Kathi encourages working out what the most important aspects of Christmas are to you, and your family, and then to just focus on those. She also encourages sharing tasks so that one person isn’t stressed out doing everything, and if you’re someone (like me) who isn’t good at accepting offers of help when you’re stressed, Kathi has suggestions for how to deal with this which are practical and helpful. It’s lovely that the book includes a reminder to plan all the things that you love to do in the build up to Christmas but often run out of time for – like driving around the local area to see all the Christmas lights or making time to go into the town centre to drink a hot chocolate while mooching around soaking up the Christmas atmosphere. I always want to do this but usually remember when it’s too late so it’s good to have a reminder that these kind of things should be scheduled in if they’re important to you and your loved ones. Kathi’s emphasis on prioritising the people who are most important really struck a chord with me and has actually helped me finally make the decision not to send any Christmas cards this year. 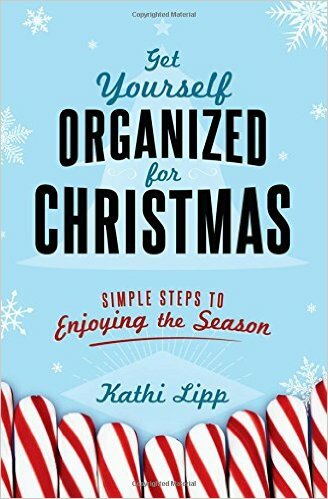 Kathi offers suggestions throughout this book on how to make every aspect of planning Christmas easier and much less stressful. This book just really makes you feel like you’re in good hands, that you are capable of having the relaxing, fun Christmas you’ve always dreamt about. I rate this book 7 out of 10 and recommend it to anyone who finds getting organised for Christmas difficult or stressful. I received a copy of this book from Harvest House Publishers via Net Galley in exchange for an honest review. Get Yourself Organized for Christmas is out now and available from Amazon. This entry was posted in Books, ebooks, Read 2015, Review and tagged Book Review, Books, Christmas2015, ebooks, Kathi Lipp, Non-Fiction, Read 2015, Review, Self Help. Bookmark the permalink.